It will comes as news to most people that the grain called quinoa is 100% protein. At least, that’s what Weight Watchers claims. Now that I’ve finally got the hang of making dry, fluffy quinoa, thanks to a friend who makes it all the time, I’m making it more often than before. The trick, I learned, is NOT to rinse it (contra WW) and to use an amount of water just under double the amount of quinoa. This recipe — the source of which I have lost but it’s from either the New York Times or the Guardian — falls into the category of Grub for its heft and into that of Salad for its forgiving caloric nature. The dressing is what really makes it. I’ve adapted the recipe for two people on a Weight Watchers diet. It’s still really good. Place the quinoa and 2 cups water in a medium saucepan over high heat and bring to a boil. Shadowcook: I started with 1 3/4 cups water and kept an eye on it. Lower heat, cover and simmer 15 minutes or until liquid is absorbed. Stir in the green onions, black beans, and cilantro. Puree the remaining ingredients together in a food processor; pour over quinoa and stir to coat with dressing. Shadowcook: Chop the green onions in chunks. The crunch makes the salad even more satisfying. Shadowcook: I wouldn’t pour the entire amount of dressing. Try half of it and then taste. Add more if the flavor doesn’t stand out. You don’t want it to get soggy. Adjust seasoning with salt and additional lime juice if desired. Serve warm or at room temperature. Shadowcook: I’ve thrown in a chopped hard-boiled egg and some blanched, chopped spinach. What else? Nuts? Hiya. 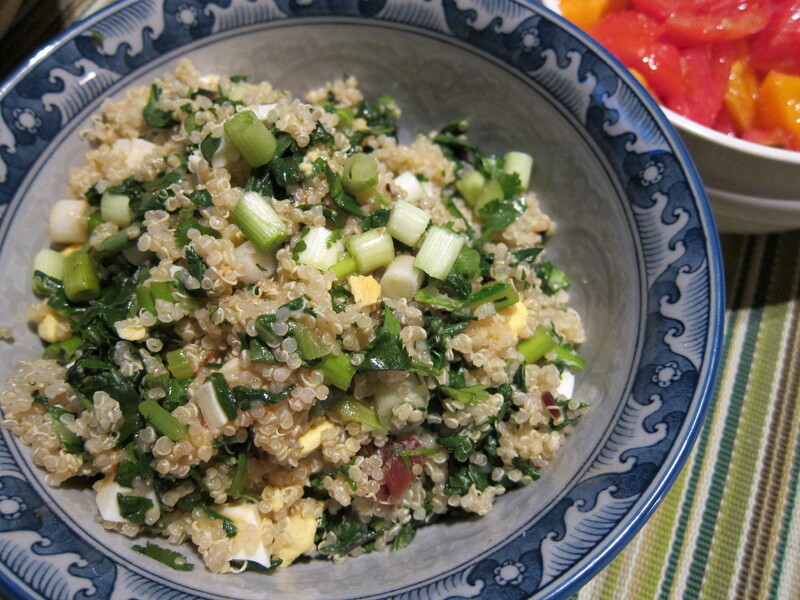 I’ve missed you and keep forgetting to swing by your blog and lo and behold, it’s quinoa! Which I’ve also recently discovered and completely fallen for. And super-extra-bonus points for a fabulous-sounding recipe that fits the whole gluten-free, dairy-free, vegetarian constraints of our (ridiculous) diet around here. And that almost never happens. Hey, Jill! Good to hear from you! These days, I’m eating in a very healthy way — and miserable. But once in a while I get to indulge myself. Quinoa, however, has become a good workhorse staple in my kitchen.